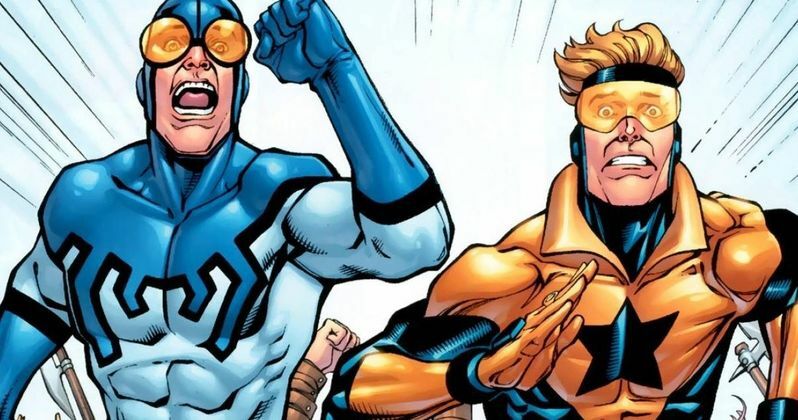 Is DC Planning a Blue Beetle & Booster Gold Movie? Nathan Fillion may get his wish to play Booster Gold after all! According to a hot new rumor from The Tracking Board, DC is planning a Blue Beetle and Booster Gold movie at Warner Bros. Backing up this latest claim is Heroic Hollywood, who say that DC is courting Marvel's Zak Penn to come in and write this crossover movie for the two slightly more obscure comic book heroes. Both Blue Beetle and Booster Gold have long been rumored to appear in one of the many upcoming DCEU movies planned at Warner Bros. throughout the end of this decade. There has always been talk that either, or both, could also land their own TV series. When Booster Gold failed to make the roster for the upcoming CW spinoff DC's Legends of Tomorrow, many speculated that a second announcement for a solo spinoff was immanent. The word now is that both heroes are being groomed for a standalone adventure. And that producer Greg Berlanti, the powerful force who drives The CW's Arrow and The Flash, as well as CBS' Supergirl, is heavily involved as both the director and executive producer. Sarah Schechter is said to also be an executive producer, with Julia Spiro overseeing the project for the studio. Blue Beetle and Booster Gold is being pitched as a superhero buddy cop movie, and is different from the other DC spinoff movies planned in that it focuses on two equally important comic book icons instead of one. The biggest difference, though, is that this will be a comedy. This goes against DC's longstanding 'no jokes' rule, which keeps the other films grounded in a world of seriousness and dark themes. No production start date is mentioned, but it's believed that the movie is being added to the current DC and Warner Bros. superhero roster, which includes upcoming films for Wonder Woman, Aquaman, Green Lantern Corps., The Flash, Cyborg and Shazam!. There are also three team-up movies in the works at WB, including next year's Batman v Superman: Dawn of Justice and Justice League Part 1 and Justice League Part 2. As you can see, that is an already ambitious slate without adding a buddy comedy to the mix. Related: Booster Gold Solo Movie Happening with Thor Writer? Booster Gold is looked at as the Tony Stark of the DC Comics Universe. He has a similarly brash and outsized ego, and a trusty robot companion to boot. Most love his snarky attitude and flashy nature. He is a showoff, and one of the first superheroes to ever accept corporate sponsorship, with various ads adorning his superhero costume (perfect for product placement in a movie). His real name is Michael Jon Carter. He first became a football hero before taking on the mantel of superhero, living in the 25th Century. He was disgraced from the game for gambling on his own team. To recover his tarnished reputation, he stole super-powered artifacts and traveled back in time to become the famous crime fighter we know and love today. Blue Beetle has a somewhat more interesting backstory. A tech-genius trying to put himself through college, Ted Kord took a job with his crazy Uncle Jarvis, only to learn that Jarvis is a mad mad intent on taking over the world. Ted calls upon the original Blue Beetle, Dan Garret, for help in stopping Jarvis. The resulting skirmish kills off both Jarvis and Dan, but not before Garret can bestow his Blue Beetle gear upon Kord, asking him to carry on the legacy. Without any superpowers of his own, the new Blue Beetle uses his tech knowhow to create new inventions, which help him carry on as a superhero. In the DC Comics, Booster and Blue frequently partner up, and they are considered close allies. Sometimes they are pulled into shenanigans that are more on the comedic side. At various times, both have also served as members of the Justice League. The idea is to have them appear in their own movie first so that they can participate in a future Justice League movie. Both characters have long been considered for a big screen adaptation. Blue Beetle was being prepped to take the place of Smallville once that series ended. Both characters did make their first and only live-action appearance on that show in the same episode. Many have thought that either or would appear on Arrow, The Flash or DC's Legends of Tomorrow. Showrunner of the upcoming spinoff Phil Klemmer hinted that something much bigger was coming down the pipeline. And it's believed that he was talking about this future feature film. Greg Berlanti seems like the perfect choice to get this project off the ground. He even scripted the pilot for a potential Booster Gold series on Syfy, which never moved forward. He currently has an overall deal with Warner Bros. And on the directing side of things, he helmed the 2010 WB comedy Life as We Know It starring Katherine Heigl and Josh Duhamel. And he has Replay with Chris Pine set as his next directorial effort. What do you think? Does the world need a Blue Beetle and Booster Gold movie? Whatever Happened to DC's Booster Gold Movie? Arrow/Flash Spinoff: Atom's Superhero Team Unveiled?